"You're never going to run off your Krispy Kremes," says Herman Pontzer, who joined the Duke faculty as an associate professor of evolutionary anthropology last year. It's not that we lack willpower or have weak minds. It's because "exercise is actually a crappy tool for weight loss," he says. Conventional wisdom says Americans have a tough time losing weight because we sit all day and eat too much junk food. Our bodies—shaped by that hunter-gatherer lifestyle—aren't adapted to spend endless hours sitting in cars or slumped over a desk and subsisting on cake and takeout, the thinking goes. While nobody lives exactly like humans did 10,000 years ago, the Hadza's way of life is perhaps the least changed, says Pontzer, who has spent the last decade studying their health and physiology. "The Hadza get more activity in a day than the standard American gets in a week," Pontzer says. By most measures they enjoy superb health. Obesity is rare. Heart disease and diabetes are almost unheard of. Their waistlines don't expand, nor do their blood pressures creep up with age. Adults often live into their 60s, 70s, even 80s, without benefit of statins or urgent care centers. 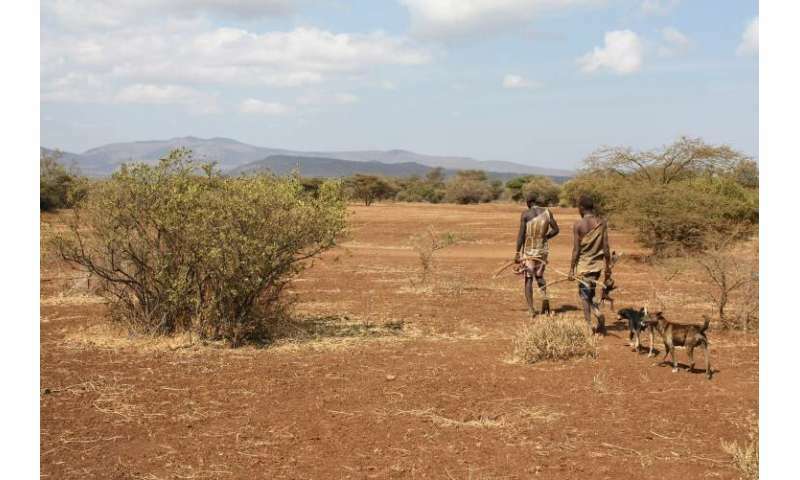 Surprisingly, the researchers found that the Hadza don't burn more calories than average adults in the U.S. and other industrialized countries. Hadza men burn about 2,500 calories a day. For Hadza women it's 1,900 calories. This doesn't mean that taking the stairs or parking far from the office is a waste of time, says Pontzer, a longtime rock climber who recently switched to a standing desk at work. Numerous studies show exercise reduces the risk of cancer, heart disease and dementia; relieves stress and anxiety and improves sleep. "I don't go rock climbing as much as I used to, but I still run to stay in shape," Pontzer said. "I'm less of a jerk when I do." So exercising is still good. It's just not going to help you drop that 15 pounds by itself. What's making us fat, the data suggest, is eating too much rather than moving too little. "It's more gluttony than sloth," Pontzer says. So should we eat more like a caveman? Pontzer says "meh" to the "paleo diet" craze. It's true that the wild game, tubers and berries that make up much of the Hadza diet carry fewer calories per bite than our beloved french fries and sugary soft drinks—not to mention less salt, fat, and more fiber. But most hunter-gatherer diets aren't as meat-heavy and low-carb as some caveman diet enthusiasts make them out to be. "Contrary to the Paleo diet evangelists, hunter-gatherers eat a lot of starchy, sugary, carbohydrate-rich foods: tubers, honey, and even grains," Pontzer says. The important insight from his work is that humans can stay healthy while eating a range of diets. There is no single, "natural" human diet we should aspire to. Is dieting or exercise better for losing weight?